Okoker All Video Splitter can help you split a large AVI, MPEG, ASF or WMV file into smaller video clips. You can extract multiple segments of any size by using the visual editing mode, or automatically have split AVI,video files into equal pieces. Xilisoft Video Splitter is perfect video splitting software to split video file to several segments with super fast speed and best splitting quality. It supports VCD, AVI, MPEG, WMV, 3GP, H.264/MPEG-4, etc. 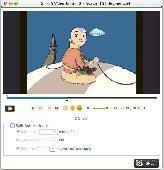 4Leaf AVI Video Splitter is a useful video software in splitting AVI, DivX, Xvid video. It provides an easy and completed way to cut selection sections out from AVI, DivX, Xvidvideos with the perfect output quality. 5Star AVI Video Splitter is a professional video file splitting tool which split, cut or trim a large video file such as AVI, DivX, Xvid into several segments. You can easily split video files by marking the start and end positions. Torrent 3GP Video Splitter is a powerful 3GP video splitter to split 3GP video files into several video clips. It split 3GP video file efficient and faster than the normal 3GP splitter,all for its unique technique-no decoding process. Torrent Avi Video Splitter is a powerful video splitting software. Using an unique technique- no reencoding process, Torrent Avi Video Splitter has faster speed and maintaining the good quality of the source file. Torrent Mp4 Video Splitter is a powerful video splitting software. Using an unique technique- no reencoding process, Torrent Mp4 Video Splitter has faster speed and maintaining the good quality of the source file. AVCWare Video Splitter 2 is a useful video splitting tool to help you split a large AVI, MPEG, MP4, MKV, WMV, 3GP, H.264, MOV, ASF, SWF, DAT or HD video in AVCHD (mts, m2ts), H.264/AVC, MKV or MPEG-2 (ts) format into smaller video clips. Xilisoft Video Splitter 2 for Mac is the next-generation device when it comes to video splitting. Sleek and simple, this great programme allows the user to split videos at will with dozens of customizable options and features. SolveigMM Video Splitter is a fast tool to losslessly split, cut or trim MPEG-2, AVI, WMV, ASF, MP3, and WMA files. Files joining supported.